The dark, rainy days of November are perfect time for a culinary tour of our great local root vegetables. 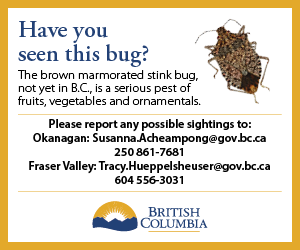 Don’t be alarmed by their thick, strange looking skin, colours or the long stems and leaves coming out of them. (Yes, this includes BC Farm Fresh’s often joked about kohlrabi that we keep comparing to space aliens.) Maybe you haven’t tried them because you’re not sure how to cook them or you’re worried about the flavour. Our local farmers grow a great selection of root crops; its’ up to us to bring them home. Beets, parsnips, turnips, rutabagas, carrots, kohlrabi, onions, garlic, and radishes are all considered root vegetables. Roots crops are some of the most nutrient-dense vegetables in the world. They are packed with a high concentration of antioxidants, Vitamins C, B, A, and iron. They are also filled with slow-burning carbohydrates and fiber, which make you feel full, and help regulate your blood sugar and digestive system. This factor, plus the high-octane nutrients and low calories, make roots excellent for people who are trying to lose weight, or simply stay healthy. Adding up all of the nutrient qualities, root vegetables are disease-fighting, immunity and energy-boosting, and are also extremely versatile in cooking. The first thing to consider is how to buy root vegetables. Selecting good root vegetables is the opposite of selecting good fruit–the harder, the better. They should be smooth and free of gashes or bruises. When choosing roots that come with leafy greens (a bunch of beets, for example), make sure the stems and leaves of the greens are firm and bright. A few tips for storing them at home. While you certainly don’t need to have a root cellar to purchase and enjoy roots, they are best stored in a cool, dark, humid room. When storing them in the refrigerator, keep roots in a paper or plastic bag in the crisper. Storing them uncovered causes them to soften and go bad quickly. Beets are another of those superfoods and are among the healthiest foods on the planet. They’re full of beta-carotene and betalains, which are antioxidants and anti-inflammatory. The betalin compound found in beets, which gives them their red color, helps to capture troublesome toxins and flush them out of the system via the urinary tract. The beet and its greens are both an excellent source of folate, vitamin A and K, and a very good source of manganese, copper, and potassium. Beets are high in fiber, which helps with satiety and regularity. Beets have an earthy, sweet flavor, and are best when roasted, steamed, or left raw and shredded. Golden beets are typically slightly sweeter than red beets. When harvested, the entirety of the plant is edible, from the tips of its leaves, down to its long pointed root. If your last memory of beets was those slices in a can; forget all about that. From juice to hummus to salads, beets are showing up everywhere, adding color, antioxidants, and flavor at every turn. Citrus (particularly oranges or clementines), blueberries, goat cheese, walnuts, ground cumin, cinnamon, and tahini are excellent compliments for beets. For our dark November days, there’s nothing like a bowl of borscht soup. Parsnips are a close relative of the carrot; but with a different colour and taste. They are harder than carrots and have a deeper, warm flavor. While not nearly as popular as its relative, parsnips used to be quite popular with the masses. Parsnips were made into wine and jam in 16th century Germany, as well as dried and ground into a type of flour for sweet cakes. Today, you’re more likely to spot a parsnip in a roast or hearty stew. Parsnips are best used in soups, pureed into a mash, or sliced thinly for a parsnip gratin. Parsnips are complimented by nutmeg, cream, and thyme. Parsnips have a fibrous core, which is why they are usually cooked before eaten, although they can still be enjoyed raw. Raw parsnips are often grated for a coleslaw-like salad, or sliced thinly for a crunchy snack. Cooked parsnips are often baked, roasted, stewed or steamed and pureed into a mashed potato-like side dish. Turnips are members of the mustard family and are related to cauliflower and cabbage. Turnips are a quintessential root vegetable utilized in many classic European dishes. Turnips are a versatile vegetable since you can eat both the root and the green. The root is usually white in color and can have a “purpleish” color closer to the top if it was exposed to sunlight while growing. The root part of the plant is high in vitamin C and the greens are very high in Vitamin A, C, E, B6, and a great source of Lutein. Best cooking methods are braising, simmering, slow roasting and sautéeing. Turnips can also be made into smooth purées and soups. Turnips pair well with other root vegetables such as beets, parsnips and carrots. They also pair with rich meats such as pork, beef, sausages and game. Other complimentary ingredients include butter, cream, cheese, chives, chestnuts, garlic, citrus, mushrooms, parsley, potatoes, tarragon, thyme and vinegar. They are great roasted, sautéed, or included in vegetable stir fry. Rutabagas are only called rutabagas in North America. Throughout the rest of the world, they’re known as swedes. Rutabaga comes from an old Swedish word: rotabagge— which means ‘root bag’. Rutabagas are members of the cabbage family and are often confused with turnips, although there are noticeable differences. Rutabagas are larger, part white and part purple, with creamy orange flesh and ribs near the stem, and with a sweet flavor when roasted. Meanwhile, turnips are white with a purple-red top and a peppery taste. They are harder than turnips and taste a bit earthier. Similar to turnips, rutabagas are subtle in flavor. Best when pureed or roasted, rutabagas go well with herbs, particularly dill, as well as lime and Indian spices. Eat them raw or cooked, but peel them first! Nutty and sweet with a mild turnip-like flavor, rutabagas can be roasted, sautéed, baked, fried, boiled, mashed, and added to soups and stews. They also can be eaten raw as a snack or grated into salads or coleslaw. A mix of mashed rutabagas, potatoes, onions, and carrots, seasoned with butter and salt, is a hearty, warming dish. We don’t really need to say much about carrots; we’re all very familiar with this root crop! 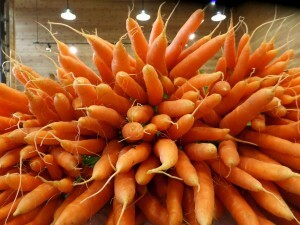 Carrots can be traced back about 5,000 years through historical documents and paintings. No one knows exactly when the first carrots appeared, because many people mistook them for parsnips, their close relative. Some cooking tips. Carrots can be eaten raw or cooked, but cooking carrots brings out their natural sweetness. Cooking carrots also breaks down the fiber in beta-carotene, making it more usable to the body. Carrots can be cooked using several methods. Some common methods are steaming, boiling, braising, roasting, sautéing, stir frying, and microwaving. Carrots should be cooked only until they are tender-crisp to ensure maximum flavor. Overcooking may also destroy some of the nutrients contained in carrots. It is important that the carrots, whether they are whole, sticks, slices, or diced cubes, are uniform size pieces to allow them to cook evenly. A medium-size carrot has 25 calories, 6 grams of carbs, and 2 grams of fiber. This root crop is an excellent source of vitamin A, providing more than 200% of your daily requirement in just one carrot. Carrots are loaded with beta-carotene, a natural chemical that the body changes into vitamin A. The deeper orange the carrot, the more beta-carotene you’re getting. Underneath the thick skin and strange tentacles of kohlrabi lies juicy, crisp flesh. The taste and texture of kohlrabi are similar to those of a broccoli stem or cabbage heart, but milder and sweeter. We’ve often found a young plant can be as crisp and juicy as an apple, although less sweet. If you love crunch, this is a great vegetable to add to a salad. In fact, fresh in a salad is our favorite was to enjoy this vegetable. A kohlrabi has two distinct fibrous layers that do not soften appreciably when cooked. Peel these layers away prior to cooking or eating raw. So what if it looks like it might fly out of your grocery bag or climb up the kitchen wall.